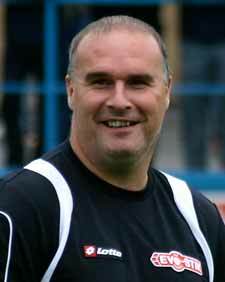 Matlock face a play off contending six pointer at Rushall Olympic on Saturday. The Gladiators are tenth, one point and one place ahead of the Pics, who have a game in hand over Matlock, with both sides having played fewer matches than rivals above them aiming for a top five finish. While a point would not be a disaster for Matlock at Dales Lane, all three would be better - and very handy - but Manager Mark Atkins (left), knows his side must be firing on all cylinders to bring home the bacon, just as they were on Boxing Day last season when they chalked up a 4-0 win. "They're a difficult side to play against and it's a hard place to go and win at, for they're a well organised strong unit" warned the Matlock Boss. "They've got a good mix of experience and youth, some six footers and also some nippy smaller lads - and that mixture can bring different things to the table. "We'll have to defend well throughout and try and get the ball down and then play our football." The Gladiators recent poor away form was ended in a 3-1 win at Frickley Athletic last time out a fortnight ago and Matlock lost the chance to continue their unbeaten start to 2014, when their home meeting with Grantham Town was postponed following the monsoon like conditions at the end of last week. It has now been rearranged for Tuesday March 4th. "It was unfortunate and just one of those things for we wanted to play as we've been impressive at home" Atkins continued. The gaffer was astute in arranging a friendly on an artificial surface against Hallam in Sheffield on Saturday which ended in a 7-1 win for the Gladiators. "We arranged the game in the event that the weather would beat us and that's how things turned out. It was a useful exercise as it gave us chance to look at one or two things and it gave the lads a run out, much better than training or twiddling our thumbs", Atkins added. Everyone came through the Hallam friendly without any harm and Atkins should name the same squad which was on duty at Frickley. Meanwhile the Gladiators have announced the admission prices for their prestige friendly with North American visitors Minnesota United on Monday March 10th. Adults will pay £7, concessions will be charged £4 with under 12's being granted FREE admission. The club is excited to announce that Matt Andrews and Alex Bradshaw have signed first team forms at Matlock Town FC. Matt is a former member of the Burton Albion academy and made a brief appearance for the Gladiators last season - and Alex is a member of the Derbyshire School Boys team. Both players have come through the under 19 and reserve side and are part of a continued efforts to bring through local talent.